PRAGUE, December 7, 2016 – Colliers International yesterday celebrated together with Yankee Candle, the world’s largest manufacturer of premium scented candles, the handover of its 31,500-square-metre production facility at Joseph Industrial Park in Havran u Mostu, which was managed by Colliers Industrial Agency and Building Consultancy team on behalf of Yankee Candle. Colliers International was selected in January 2015 to manage the development of their first production and distribution facility for the U.S.-based Yankee Candle in Europe, which is due to start commercial operations in early 2017. “This project is a great example of our ability to provide a coordinated regional and departmental service. Involved from an early stage, supporting with the land acquisition and feasibility, then managing the development process through to handover,” said John Newton, Head of Building Consultancy for Colliers International. Initially Colliers International supported Yankee Candle with the identification of a suitable site in the Czech Republic. Colliers also coordinated the design process and provided on site monitoring throughout the construction. At all stages communicating with the whole project team to ensure the project has been completed to the client’s satisfaction, within budget and on time. 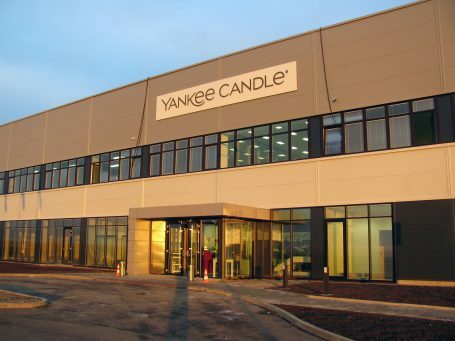 “We are fortunate to have worked with such a reliable partner as Colliers, who was able to take us smoothly through the development process until handover,” said Melanie Stack, President of Yankee Candle EMEA. The location of Joseph Industrial Park in Havran u Mostu was chosen due to several reasons: the strong local manufacturing heritage, local infrastructure and skilled workforce, as well as, the central and geographically convenient location in Europe. In addition to Colliers work, Denton’s provided local legal counsel and Takenaka were appointed as the EPC delivery partner. “We have been very happy to work alongside Yankee Candle, Denton’s and Takenaka on this project, it has been a great team effort all round. The end result – a fantastic new production facility that will provide around 300 employment opportunities to Most and the surrounding area,” concluded John Newton.